There is little doubt these years are proving increasingly impossible for Labour but I believe the key moment occurred many years previously, in the mid 1990’s. The SNP Executive Committee had to make a key strategic decision, to join the Constitutional Convention or to remain on the outside. The Executive was divided with some favouring joining with the Unionist parties and others, myself included, who were firm in our belief that if the SNP stayed on the outside, keeping the pressure on and threatening electoral defeat on the unionists if there was any backsliding then that was the best way of ensuring a new Scottish Parliament. I had been involved in several “all party” campaigns, all of which started with great energy but which slowly ended up in dead ends as progress was restricted by the slowest traveller. Scotland United was a great example of this following the anger in Scotland in 1992, where the electorate removed every Tory in the land but still ended up with a Tory Westminster Government. The desire for an “all Party” solution led to Scotland United which allowed a skilful George Galloway to capture that anger and energy and slowly dissipate it up every dead end alley in sight until all the promise was gone. I mention this because it was the creation of the Scottish Parliament that has transformed Scottish politics. Prior to the Scottish Parliament, the SNP had briefly held eleven seats at Westminster but the norm was usually 2, 4 or 6. In contrast Labour were dominant holding 50 plus at any time. This effectively meant that when you added on the constituency office employees and the full time staff at Westminster Labour would have ten, sometimes more than twenty times the number of full time politicians and staff to the SNP, a huge advantage. The Scottish Parliament changed all this, from the first election that ratio had disappeared, the SNP would still have fewer but for the first time a sizeable platform of full time SNP politicians and staff were in place. We have never looked back since that moment it has been steady, and sometimes spectacular progress ever since. The Unionists thought they were still safe, that the electoral system had been specifically designed to make it impossible for the SNP to win majority control. Labour and the liberals thought as long as they worked together the system would ensure perpetual coalition Government in Scotland for the two parties. Alex Salmond’s one seat victory in 2007 shattered that illusion and the effective way the SNP minority governed led to the 2011 landslide victory and Scotland’s first SNP majority government. The 2015 General Election electoral massacre of the Unionist Westminster parties has now ensured it is the SNP who now have by far the biggest army of fulltime MP’s, MSP’s and full time paid staff across the country. With a membership of 115,000 members the SNP are in an incredibly strong position and that strength must now be used effectively in the coming Scottish elections and the crucial Local Government elections in 2017. The Scottish Elections are close now and the polls are looking promising but we need to keep the pressure up and remove as many Unionists as the electoral system will permit. Thereafter we move to what I believe will be the elections that I believe will determine the outcome of Indy Ref2, the local elections. Labour, despite its strength over many years does not have a big membership. It is often kept going by the elected councillors and their families. Our experience here in Paisley is pretty typical of Labour across the country. The first areas to fall to the SNP in Paisley were the big council schemes. They had been represented by Labour for generations and frankly their votes were taken for granted by Labour. By replacing “low energy” Labour councillors in these areas with “high energy, capable SNP councillors” folk noticed the difference and a few years later they were swept back into office with bigger majorities. It was noticeable that the Labour campaign was weaker with fewer activists at these elections as the “payroll” activist base had been removed. At the following elections the process continued and at the most recent General Election Labour had to bus in activists from all over the country to try and save Douglas Alexander. It didn’t. If we can dramatically remove the Labour Councillor base we take a giant step forward towards Independence by removing large swathes of the already diminishing Labour activist base. So the agenda is win big in May, take the summer off to recharge the batteries, then all guns blazing through to May 17 when we deliver the coup de grace! The SNP leadership is well aware of the facts, but has never acknowledged them to this day. 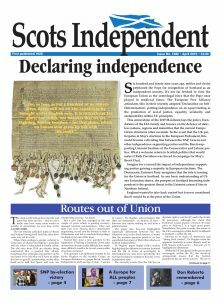 Still, let’s not split hairs at this stage – we need unity amongst all points of view on the single issue of independence, which is completely realistic even in the light of the vastly changed world environment. What is not realistic is Scotland in the EU, but that is another issue.